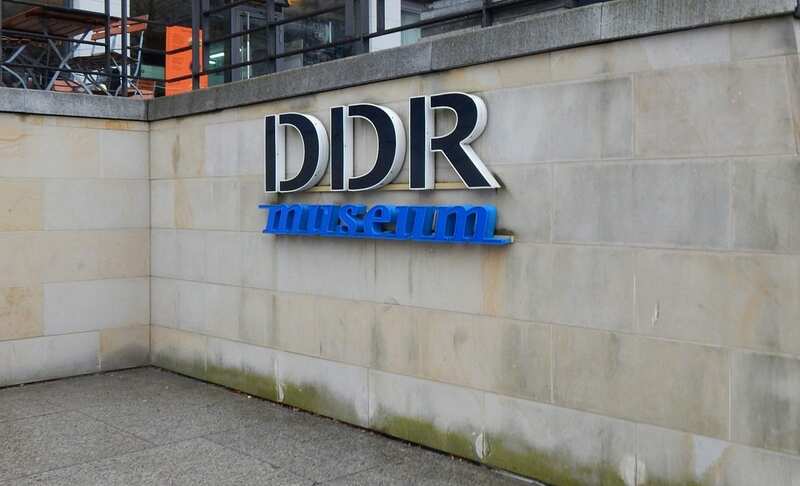 Maybe it’s because I loved the TV show Deutschland 83 and the film Good bye Lenin, maybe it’s because I’m forever haunted that a city can be divided in half, or maybe it’s the wild wallpaper… but I really enjoyed visiting the DDR Museum in Berlin. This little hands-on museum is a fascinating look back into the not to distant past to a time when Germany was split. 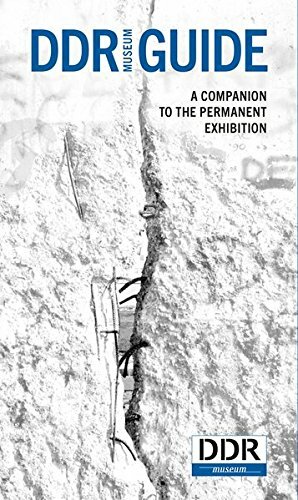 But it’s not just a museum about politics, and not merely a museum about how “terrible” life was behind the Wall. 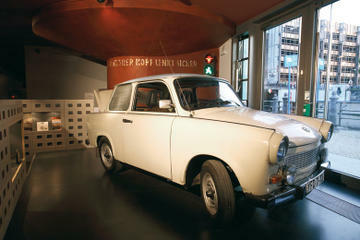 The Berlin DDR Museum is a look at everyday life, products that people used, sports, school, food and how people lived. The Spree river flows around Museum Island, and there, behind the Berlin Dom, on the opposite riverbank, you will see a line-up of open topped tour boats, restaurants. Below sidewalk level, and down along the water almost hidden, is the blue sign for the DDR Museum. When I visited, it was a holiday week, and the line outside was a bit long, but my daughter assured me that the wait was worth it. I could already see the Trabant in the window. Some people were climbing in and “driving” it, others were thunking their hands on the fenders with a look of in-credulousness… I needed to get closer. Fair warning… it isn’t an inexpensive Museum to visit. At the time I went it was 15€ for adults. 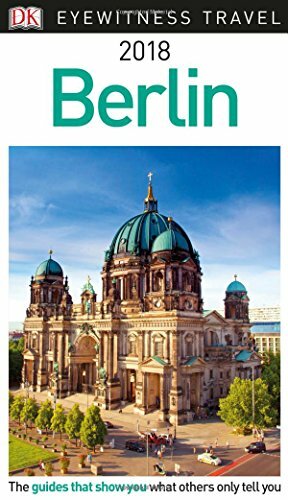 I was able to save 25 % on my entry fee because I bought aBerlin Welcome Card before leaving home. (My daughter is a student, so she gets discounts everywhere already). The Berlin DDR Museum is made up of a few large rooms divided by banks of cabinets, each with a specific theme. The cabinets have open windows filled with things, drawers you can pull out and peek into, and some doors that you can open and inspect. Inside you will find EVERYTHING from potty chairs to school books. You really are encouraged to get involved.. not just read. This isn’t a ‘passive’ museum. (Note- you can’t touch everything.. much is now behind glass… but there is still a lot of ways to be interactive with the museum). But there was more to see than the car. There was a day care room… set up perfectly.… as if waiting for children to arrive. A woman sat in the corner explaining the child care system. Books were on the shelves as were colorful toys. And I love the multi-child push chair! But I absolutely loved the WALLPAPER! Who else remembers these patterns? And of course, the Sandmännchen!!! Read more about him here–> Sandmännchen! Maybe that is what makes the Berlin DDR Museum so special. It celebrates the everyday. From the plastic chicken Egg Cups to the cans of Rotkohl. From puppet theaters to string shopping bags. These are things that people used. This wasn’t just about politics, it was about home, and making the best of what your home is. 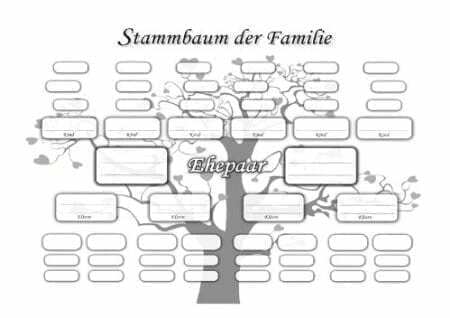 The Germans in the East were still German, and even though there were some Russian influences, the cookbooks, and the love of Fußball are still strong. Because politics and Stasi were such a central feature of life in the DDR, there are segments of the museum devoted to them as well. A table in an interview room. A telephone at a desk. Maps and reminders of what happened when people stepped against the rule of the land. 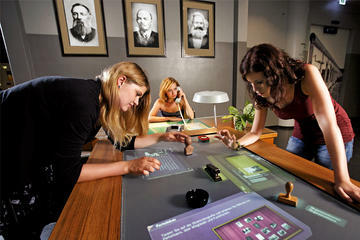 But the DDR Museum in Berlin isn’t ABOUT that… it’s about life. So for every object or display about politics was more than balanced by clothing catalogs (oh those fashions!) and vacation photos. The Marriott is centrally located, near U Bahns and S Bahns… and you get a wonderful German Breakfast! Because I visited Berlin during the Easter Holidays, there was a line, and the museum was quite crowded. It might be best to plan a visit for mid-week, or in the morning. It’s not a big museum, so you can actually zip through in an hour (or less)… I would suggest you linger a bit, and stay longer. Don’t expect it to take up your afternoon though. Just inside the door they have lockers to hold your personal items. You do want your hands free to open and touch! And of course, there is the obligatory gift shop where you can buy egg cups, post cards, and pieces of the Berlin Wall (I swear, all those authentic pieces of the Wall… it must have extended to the moon and back!). As I said you can save money on the 15€ tickets by either buying them in advance or purchasing the Berlin Welcome Card for a discount. 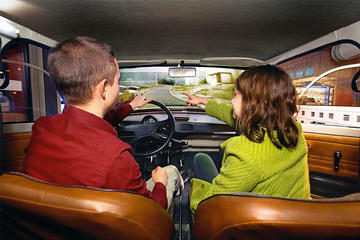 Why visit the Berlin DDR Museum? The Berlin DDR Museum is an interesting and nostalgic look back. I think it’s well worth the experience, and I would recommend it to anyone who wants to get a feel for life at that time. Then, go up onto the banks of the Spree, sit down in one of the many cafes that line the Promenade, and relish the world we live in now. previous My Week in Berlin- Museums, Currywurst, and a LOT of Cake! 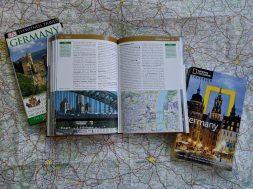 next Berlin Food Tours- One City, a World of Tasty Food!! I have been there in 2003, with my nephews East German wife. War sehr schoen und interesant.